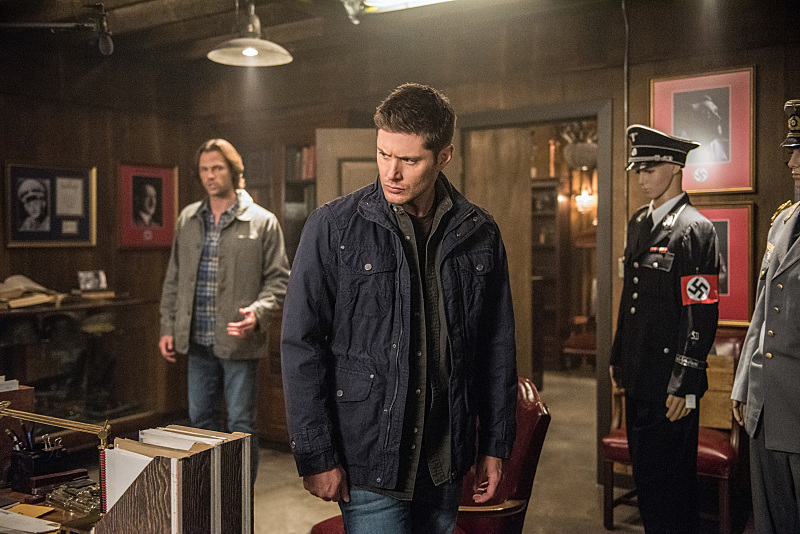 During Thursday’s episode, Sam and Dean once again found themselves fighting Nazis. However, this time around, they came face to face with Adolf Hitler. For real, the fictional version of Hitler. The Thule (aka, Nazis) came back into the picture (the Winchesters have previously fought them) to resurrect Hitler once and for all. How the heck do you bring back the genocidal maniac, you might be asking? Supernatural‘s version of Hitler’s death included his loyal followers trapping his soul inside a pocket watch (you know, like a horcrux on Harry Potter). Then, they needed to find Hitler’s blood relative because that is the only way his soul could inhabit a body. For many viewers, the timing of this episode was a bit eerie. Ever since he decided to run for president of the United States, Donald Trump has been compared to Hitler. Now that he beat Hillary Clinton in the 2016 election and is the president-elect, Supernatural fans couldn’t help but think of Trump while watching Sam and Dean try to stop the former Nazi party leader. There was even one particular scene in the episode titled “The One You’ve Been Waiting For” after Hitler was resurrected showing him as extremely goofy and eccentric. He even danced around a bit, which is something many fans probably didn’t expect. It was quite comical, which might’ve been the point. It’s unclear if the episode’s intention was not only to compare Hitler and Trump, but to show just how many believe Trump is one big joke. Whatever the case, it was hard to ignore and here are just a few ways fans reacted to the episode. Who knows if it was Supernatural‘s intention to make this particular episode so timely, but it definitely spoke volumes at a time when parts of the nation are still trying to come to terms with Trump as the 45th POTUS.